Dorchester Chamber of Commerce awards Interstate Container Cambridge for its significant contribution to the county’s advancement. Corrugated packaging manufacturer, Interstate Corrpack (DBA Interstate Container Cambridge) has been named Large Chamber Business of the Year at the Dorchester Chamber of Commerce awards ceremony in Cambridge, Maryland. Dorchester Chamber of Commerce grants awards in six categories to individuals and thriving businesses in Cambridge, Maryland that have positively impacted Dorchester County. 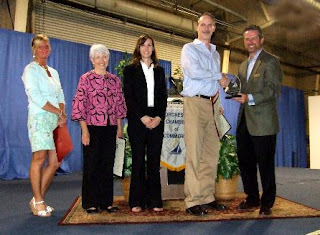 Interstate Container Cambridge received the award for its good standing with obligations and active support of the community and chamber activities. The company recently participated in the recent Dorchester–Düren Sister County Partnership trip to Germany to foster economic growth in Dorchester County. In addition, the chamber acknowledged the innovation and employee cooperation required to develop the company’s innovative and eco-friendly GREENCOAT® wax-replacement boxes. The recyclable, repulpable and compostable GREENCOAT® corrugated boxes are used for packaging bulk poultry, seafood, meat, fresh produce, and floral products. In order to be eligible for the Large Chamber Business of the Year award, a company must employ over 25 people, have been established for at least 5 years, and confirm business growth. Interstate Container Cambridge demonstrated business growth, through plant production volume, increase in employees, acquisitions, and locations of operation. In addition to the Large Chamber Business of the Year, Dorchester Chamber of Commerce also awards Business Woman of the Year, Business Man of the Year, Small Business of the Year, Volunteer of the Year, and Non-Profit of the Year.